The HydroContest is ready to welcome spectators for the races, but will also propose various activities for everyone. The crowd will have the chance to test the radio controlled boats in a pool attached to the main pontoon, in front of the race spot. The 10 models of foiled boats are 60 cm long and created by Hydros in collaboration with the naval architect Antoine Mainfray. They will be available all week to test the hydrodynamic and the energy efficiency of the foil technology. 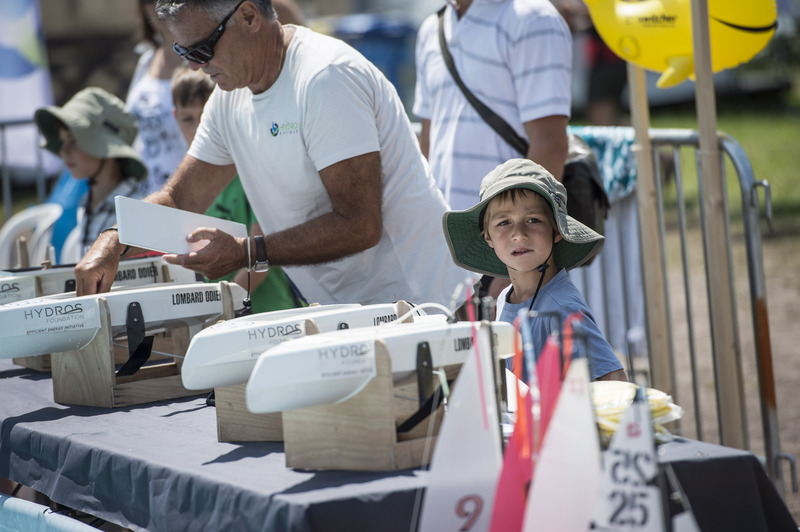 On the cultural side, people will take a look at the exhibition “Hydrofoils, from crazy pioneers to high efficiency”. This exhibition retraces the story of the flying boats, taking the spectators in a voyage of a 100 years of innovation. Exciting new feature of this year: a virtual reality experience will be set up at the end of the exhibition, you will feel like you are on the Hydros.CH ambassador boat. Thanks to our partnership with the Museum of Transport in Lucerne, the first electric bus from Switzerland, named Mathilda, will be in exhibition in the village of HydroContest, demonstrating the power of energy efficiency for over 100 years. The audience will also have an opportunity to see the final stages of the competition in paddle board. Fool Moon will provide 15 paddles to live the experience HydroContest optimally.